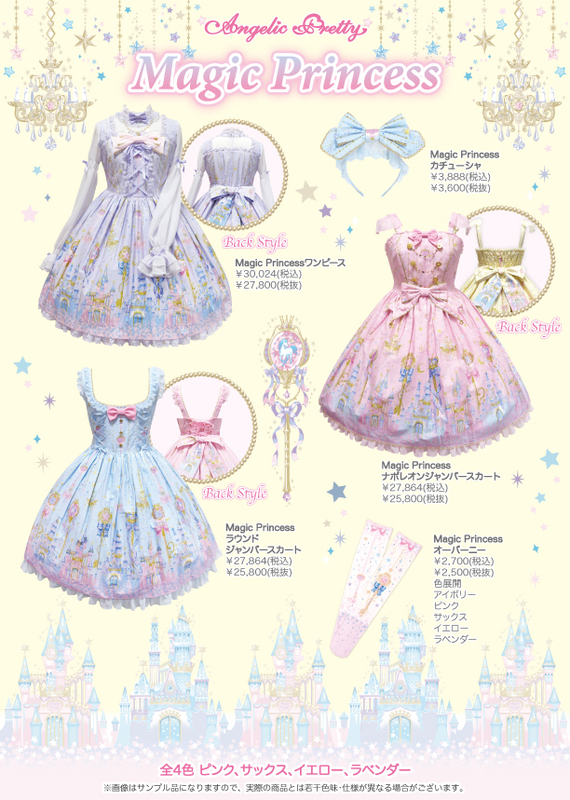 Angelic Pretty are starting up their line up of spring releases with Magic Princess! I actually really love this print, it looks like magic sand castles. The print is really cute and has so many nice details. I like the star detailing at the bottom and I think the boarder print has a nice scale. The scepters with unicorns, stars and other motifs really pulls the boarder together with the rest of the print that has chandeliers and stars hanging down. Finally a print that doesn't feel like a new version of something they already did before. I like that the sax version has pink stars on the bottom, prints with contrasting colors is really my thing. All the colorways look super cute actually. I'm just totally on board with this concept. I think the cuts are really pretty too. The Op has really nice detailing, I think the sheer sleeves will look really cute with this print, I like that the bow on the top is in a contrasting color, I hope it is so on the other colorways too. The jsk with the button detailing is nice but the buttons looks a bit just thrown on there, I think it needs more detailing around the buttons. I like the second jsk but this cut makes it harder to find a blouse that suits it I think. The star buttons look cute though. Its too bad that the bottom part of the dress is super plain on them, a little more trim and frills on at least one of them would of been cuter. All in all I think they are still cute. I really look forward to seeing people coord this print, I think it would work perfectly with ott sweet. There are so many options for making custom made pieces to go with it. I just hope that someone makes a scepter or perhaps a castle headpiece? I hope I can someday get my hands on this!